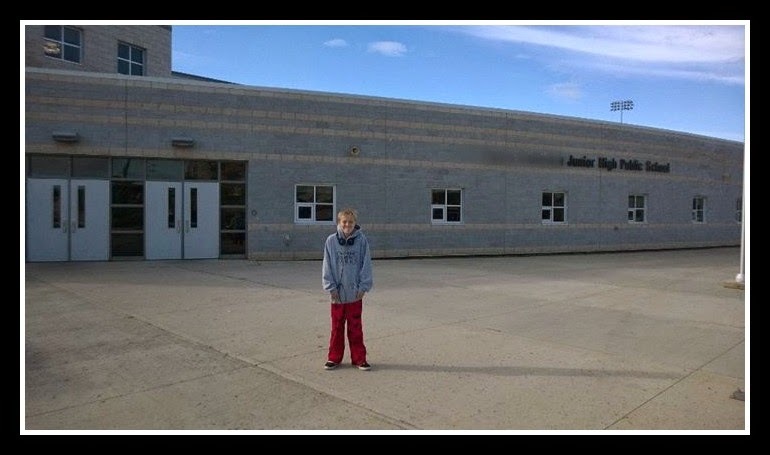 When my son entered grade 7 I was freaked out ... for all sorts of reasons. Freaked out because he was getting so old, freaked out because the school was way bigger than he was used to and there were so many kids and we were in a new town and he didn't know anyone, freaked out because he would be changing classrooms and teachers several times a day and there was just SO MUCH that he would have to deal with every single day, freaked out because junior high can be so tough - especially for a kid with Autism. But not once did it ever occur to me that my son being in grade 7 would be a trigger for me. It never even crossed my mind that something as simple as his AGE would cause crap from my past to come rushing back to me - to fill my mind with things I thought I had long since dealt with. I guess that is the thing about triggers... you just never know when they are going to come up and smack you in the face. When my son came home in those first few weeks of junior high talking about the graffiti he saw on the bathroom walls or the words he had heard in the hallways and asking what it meant I desperately wanted to turn to him and have a simple discussion about it. But instead my heart would drop and my stomach would burn and my anxiety levels would skyrocket and the tears would threaten and I would have to practice every one of my coping mechanisms just to get the most basic of explanations out. Flashbacks and floods of memories and nightmares would accompany every single one of the conversations for days or weeks afterwards until I could process it all again. When he tells me about things that happen at school I always have to ask myself if my reaction is based on logic and reality or some emotional response triggered by things that happened to me over 25 years ago. Some part of me always assumed that it would be more difficult for me when my daughter reached junior high. Maybe I figured I wouldn't have to worry as much about my sons. But I have found that it is almost painfully important to me that my sons don't turn into THOSE boys. Because I am certain that THOSE boys' mothers didn't think their sons were behaving the way they were towards me. Peer pressure is a powerful thing. Even boys who have been taught well can turn into complete idiots when surrounded by a group of idiots. And so I continue to do my very best to teach my boys that no means no, to respect women, the meaning of consent, and how important it is to stand up to peer pressure. I am raising feminists and I am proud of it. I also remind myself that even though there are some things we really never fully get over it doesn't mean we will sink into the darkness. I have support. I am not alone. There are a lot of really good men in this world - I am married to one of them so I know that for sure and that means my boys have a really great example to follow. There is always hope. Junior high... I sure didn't love it the first time around and apparently it is just as difficult going through it with your kids. Just think - I only have like... 6.5 more years of junior high to go!